Chocolate is everywhere! It’s everyone’s favorite tasty treat. 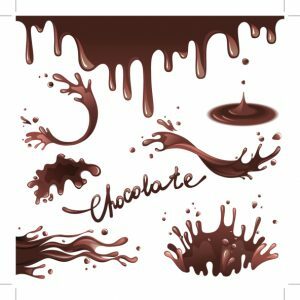 When consumed in moderation, in recommended serving amounts, chocolate is no more likely to cause cavities than anything else you eat. In fact, studies show that some chocolate contains minerals that counteract the acidic, cavity-causing sugar. It is also good to remember that nothing prevents cavities better than regular brushing and flossing! Chocolates contain sugar and oils, so they must aggravate acne, right? Actually, no. Studies performed by the U.S. Naval Academy and the University of Pennsylvania show that there is actually no correlation between chocolate consumption and acne. Despite the fact that cocoa butter contains saturated fat, studies conducted over thirty years show that it actually doesn’t raise the amount of cholesterol in your blood. The presence of stearic acid in cocoa butter actually offsets the palmitic acid, which is a saturated fat. When consumed in suggested serving sizes, a serving of chocolate doesn’t contain any more caffeine than a cup of decaffeinated coffee, which is about 6mg. Additionally, there have been no published studies showing any health problems caused by the caffeine in chocolate. Actually, chocolate milk, when consumed in moderation, is no worse than regular milk. In fact, it usually contains even more potassium, zinc, and iron than plain milk. This entry was posted on Wednesday, January 24th, 2018 at 4:32 pm. You can skip to the end and leave a response. Pinging is currently not allowed.